The margins in top level-sport are cigarette paper thin…just ask Jacob Stockdale. For so long in this fixture Ireland were unkindly, if accurately, dubbed the 60 minute men, the idea being that even if they could hang with the All Blacks in the early going, the cream would eventually rise to the top. There have been plenty of examples over the years, where one moment turns the tide and what once seemed a competitive Test is suddenly drifting towards its always suspected conclusion. 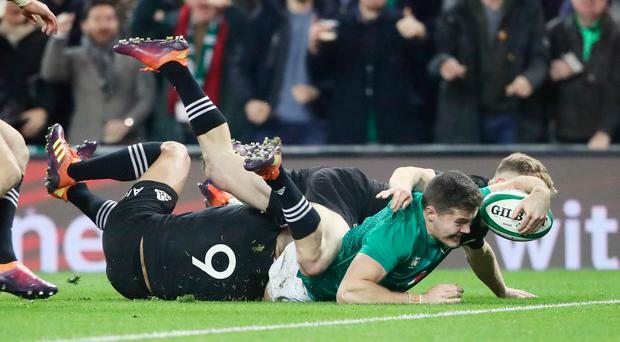 This is a different Ireland, of course, their achievements under Joe Schmidt a testament to that, but there was a split second shortly after the turn when things felt eerily familiar. Just over 43 minutes were on the clock when Damien McKenzie kicked over the top. Stockdale, with a deft touch not out of place at Windsor Park a day later, controlled the ball and looked up. Kieran Read was in front of him, the All Black captain and former World Player of the Year. His 6'4'' frame was thrown in the way of Stockdale's chip, the line at the Kiwi's mercy. Somehow, he knocked the ball on, a rueful smile and a frustrated clap of the hands betraying the fact that he himself knew a glorious chance to give the visitor's a first lead of the game had been blown. What was going through Stockdale's mind as he blew past Read only to see the ball going in the other direction? "Please drop it," he smiled. "And he did. He must have been listening to me. "Those are the kind of things that are a bit of a risk. Sometimes they pay-off. Sometimes they don't. This one didn't pay off. But, in the end, I suppose, to an extent, I got a bit lucky. That's rugby union. It's a bit of a cliché, but it is." There's the old saying that it's better to be lucky than good. Stockdale is undoubtedly both. The 22-year-old is a player unafraid to take risks - his second try against Wales in the Six Nations a case and point - and it was fascinating to see how that mindset survived undeterred after his brief flirtation with disaster. Only three minutes had passed when he had the ball in his hands again following a brilliant set move off a lineout. With his captain Rory Best outside him - the Irish skipper is many things but he was not, in all likelihood going to run it in from there - Stockdale looked up and saw Brodie Retallick in his way, an imperious figure with four extra inches to his frame than Read. There were no second thoughts based on what had went before, again he chipped ahead. This time it was perfect, just over Retallick and the bounce allowed him to beat Smith and slide across the line. "Look, to be honest, that's the message we get from the coaches, we play heads-up rugby," he said of his mindset in the moment. "They give us that confidence to back ourselves. "The first chip was maybe not the best decision I've made on a rugby pitch. The second one was a bit better. These things happen, I suppose. "It was an incredible feeling but I can't take too much of the credit. That was a training ground move and it paid off massively. "The lineout worked superbly. Bundee gave me a great pass. I didn't have to reach for it or anything. "Those are the kind of situations that you wan to be in, as a winger, 24/7. "It was just super, as a team. "For me, it was just I saw Ben Smith had come up on the edge to defend Bestie and I saw the space in behind. "It was a slightly different kick, a longer kick, to chase on to. I was just playing in the moment. "You can't think about that kind of thing (the previous mistake) whenever you put a ball down." His 12th Irish try - the same number as Keith Crossan and more than Trevor Ringland -came in just his 14th Tests, arguably exceeding Twickenham in March when it comes to famous scores on famous days. When Ireland beat the All Blacks in Chicago two years ago, he'd watched at home on TV with the rest of us. He'd come off the bench to score a try - only his second as a pro - one night prior in a truly wretched Ulster defeat away to Edinburgh. While he did have some related previous exprience in this regard, having beaten the 'Baby Blacks' at the under-20 World Championships of 2016 alongside James Ryan and Andrew Porter, to be a part of such an occasion was truly special. "Oh it means everything," he said. "There's 113 years of guys who have played in Lansdowne Road or the Aviva and have failed to beat them, so for me to beat them at my first attempt is pretty special. "I think I was still in the Ulster Academy at that point (2016 Autumn Internationals). I'd barely played for Ulster, I'd played a couple of games. "Then it was more me as a fan watching Ireland beat the All Blacks, it was incredible. But to actually be a part of it this time, is pretty special. "Part of me can't believe it, it's been an incredible road to where I'm at at the moment. "At the same time it's been an awful lot of hard work, there's been an awful lot of lessons as well, and I suppose that's what it takes to progress, in international rugby and professional rugby in general. "It's been a massive year and a half for me but I don't plan to stop any time soon." There is, after all, a World Cup just over the horizon. When asked if Ireland's two victories in two years over the back-to-back champions have "shattered their aura?" he naturally pauses before declaring diplomatically "we'll just have to wait and see."